As we’ve discussed concerning the infinite banking concept®, whole life insurance should NOT be pitted in side by side comparisons with various financial products BUT rather can serve as a strategic tool for growing your wealth safely while also providing a means to pursue any number of other investment opportunities. Other supposed preferred investments for wealth building such as Roth IRAs and the notorious 401(k) do not fare well when re-framing the discussion in this light. This article will take things a bit further than previous articles to consider how the strategy originally coined by Nelson Nash as the infinite banking concept, can extend much further and offer much greater opportunity than simply providing a ready reserve account for retirement, recapturing debt, or purchasing a car through a policy loan. We refer to our “expansive” illustration of infinite banking as “Strategic Self Banking” and admittedly, some may believe that we’re going out on a bit of limb. Having reviewed the data and considered the results…we don’t think so. Behind the curtain, those who really know how to use a cash value life insurance policy for strategic personal banking understand that it is not simply a place to park your money. 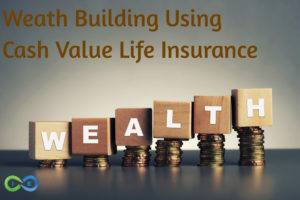 Rather, this strategy utilizes cash value life insurance as a conduit for your cash flow assets in a way that can create maximum financial leverage and exponential growth of your wealth in a safe and highly predictable way. The philosophy of money that underlies the Strategic Self Banking method and that of infinite banking in general, is that money needs to move and not stay stagnant. This is referred to as the velocity of money. Contrary, to the commonly touted strategy of parking your money in a bank in or financial account, such as the stock market, we contend that your money should be used presently for the most advantageous use in order to build wealth for you and your loved ones. The first step is to utilize a proper “safe bucket” for saving funds, protecting them and gaining the potential for tax advantaged growth and future death benefit. Clearly, if you haven’t taken this step, you’re staking your entire nest egg on the whims of the financial markets much to the glee of stock brokers and bankers across the country. As we’ve discussed concerning the money secrets of the wealthy, those in the know generally don’t risk their safe assets on speculative investments. Add to this the reality that whole life insurance is a non correlated asset that is not privy to the rise and fall of the stock market. Having a guaranteed return investment vehicle as your safe bucket will help remove much of the drama and emotion that comes with being fully invested in the stock market. So step one of Strategic Self Banking is to begin investing your wealth in a properly funded whole life insurance policy with an advantageous mutual company. Step one takes care of your safe bucket…offering a guaranteed rate of return (or slow ongoing growth), historically backed tax free life insurance dividends and asset protection under many state laws. Of course, depending upon your financial circumstances, step one can take some time because, just like purchasing real estate and any other assets, there are some start up costs for properly funding your policy and allowing your cash value to accrue. Generally, this can take 5-7 years; although, it can be expedited through a paid up additions rider and/or a supplemental term life rider on your policy to make sure that a modified endowment contract (MEC) doesn’t occur. Step two of the Strategic Self Banking process is to locate an acceptable secondary investment asset in your area of interest/expertise and use your accrued cash value for this acquisition. In today’s information age, the possibilities for such cash flow assets are wide and expanding every day. For example, there are web based ways to invest in fractional interests in everything from oil wells, to coffee farms, to hard money lending, real estate and robo advisors. These investment avenues for cash flow assets are direct, cooperative with other investors and OUTSIDE of the financial markets, and thus often offer the full tax advantages associated (based upon your investment and percentage of ownership) with such investments as if you acquired the coffee farm yourself. New avenues for such investments are appearing every day and the possibilities are becoming endless. Your participating cash value whole life insurance policy through a mutual company, properly funded, should be utilized as a conduit for purchasing other cash flow assets that offer a higher rate of return and the proceeds from those investments can be directed back into your cash value policy. So, as we’ve discussed in previous articles about the infinite banking concept®, you use the cash value from your policy to invest in step two in the form of a policy loan and NOT as a withdrawal from the cash value. The easy, quick, flexible access to cash in the form of inexpensive loans that are secured by the policy is a key feature of any infinite banking kind of policy. For those of you who think a policy loan sounds like a dirty word, this could be compared to taking out equity from a parcel of real property in order to fund a second investment BUT WITHOUT the inherent difficulties in doing so, such as a stringent bank approval process and strict repayment terms. You may now be asking what the advantage is to just saving up the cash AND why a loan verses withdrawing from the cash value. There is an underlying philosophy of money that makes it much more advantageous to borrow money from your cash value policy as opposed to saving cash AND there is also sound financial reasons for doing so. The philosophy of money that we’re talking about is the concept of Economic Value Added (EVA) which in its simplest form means that your money has value. So, when you use your own cash, you’re giving up the opportunity cost for other uses of that money. Our countries largest corporations figured this out years ago AND their balance sheets transformed (and stock prices jumped) as a result of this shift in understanding. Thus, there are sound financial reasons to value your own money and NOT to leave your cash in a conventional bank, earning less than 1% in today’s financial climate, because this is simply giving someone else (a bank) the use of your money while allowing your wealth to stagnate. …aren’t I giving up the use of my cash when investing in cash value life insurance and not investing in step two immediately without taking the time and expense to invest in step one? First, unless you already have a safe bucket, then investing in riskier investments with your nest egg is like trying to build a house without digging the foundation…the house may stand up for awhile but there is a risk of eventually caving. Second, the specific type of safe bucket offered by a properly funded whole life policy provides a way to get ongoing exponential growth which may be described as multiple levels of financial leverage, or wealthy compounding upon compounding…this is the idea behind exponential wealth building. You cannot have true compound interest growth with the ebbs and flow of the stock market. True compounding takes place in an environment free from stock market declines and taxes. Each will eat away at your principle and destroy the compounding power of your money. When you borrow money from a well designed cash value life insurance policy, your policy growth can continue without interruption. You’ll receive an ongoing guaranteed rate of return that never changes, regardless of policy loan amounts AND you also will receive, on high probability based upon over a hundred years of payment history, ongoing dividends at full dividend rates. You read that right, while your loaned cash value is working to earn you money in other areas, you’ll continue to receive tax advantaged dividends at the same rates based upon the entire cash value of your policy. Dividends that are considered a return of premiums to policy holders are not taxable under current laws allowing for tax free ongoing growth of your cash value. It gets better because you also can get a positive arbitrage on your borrowed funds. So, although you’re paying a reasonable rate of interest on the borrowed funds (5% in today’s market), your dividend rates will exceed the interest (5-7% in today’s market), allowing for a positive rate of return on the borrowed funds themselves. Add in the potential return of your investment you use your policy funds to purchase and your true rate of return may be much higher. Step three of the Strategic Self Banking method is to return profits from your higher risk, higher return investments to repay your cash value life insurance policy. Think of this as “completing the circle” or your own personal whole life banking cycle. This idea is fundamental to infinite banking AND yet we are emphasizing and clarifying its importance to your overall wealth building strategy. Bringing the profit from your higher risk investments to repay your safe bucket of cash value life insurance, is like putting gasoline in the ever working engine that this asset represents for a couple of key reasons. Repaying the cash value in your policy allows it to exponentially grow, allowing more cash value, more guaranteed growth, more tax advantaged dividends, growing death benefit and essentially a compounding AND EVER EXPANDING SAFE BUCKET to provide greater means to pursue, higher risk, higher return investments…and the strategy compounds and grows and grows and compounds. There are some things about the mechanics of this strategy that can be tricky to explain AND quantify when you analyze how repaying these types of life insurance policies actually works. As in many aspects of business, the numbers often tell the tale, and infinite banking is no exception. First, and the most obvious reason, is that you’re no longer paying interest on the policy loan, which has been been deducted from the policy growth and NOT the cash value, and this repayment allows for faster cash value growth. Second, when interest is paid back to the policy, it functions much like additional paid up additions, leading to faster increases in cash value and higher dividends. Third, it appears that the life insurance policy tends to reward bonus points, revealed in the non-guaranteed portion of the policy growth over time. My best explanation of this is that these ever conservative whole life insurance companies prefer to under promise and over deliver. So, the power of this repayment approach, inherent in infinite banking, is best revealed in an illustration that shows how the policy will exponentially grow upon repayment of loans over time. Step 4 of Strategic Self Banking is to maximize your safe bucket assets. In other word, use your profits from your higher risk, higher return investments to, you guessed it, purchase more cash value life insurance. Your individual circumstances will dictate whether this step should be taken after your initial policy loans have been paid back, or whether it may be more advantageous to start another policy. All of these question require a close look at assets and liabilities and how the various assets in your different buckets are performing. The key is to use your higher risk, higher return investments to continually fortify your safe bucket of cash value life insurance AND then use your safe bucket to continue to fund higher risk-return investments. This approach allows true compounding policy growth of your cash account and an ever increasing death benefit in addition to the rate of return generated by your higher risk-return investments. So, for example, if you’re getting a 2% arbitrage on borrowed funds in your cash value safe bucket, and you’re getting 8% cash on cash return on a real estate investment (not even accounting for tax advantages), what is your rate of return? Some may say 10% and, although this is nothing to scoff at, yet this could be short sighted. First, you won’t likely borrow ALL of your cash value, so you’re still getting 7% (in our example) on the non-borrowed portion. Second, your policy gains are tax free and thus better than your average 2% in the market AND your real estate gains are also likely tax advantaged AND we haven’t even reached a discussion of depreciation or the deductible expenses of maintaining your real estate investment…(similar tax advantages can apply to many other asset categories as well). Don’t miss the fact that in the above examples, your money is working hard and has never stopped moving, i.e. the velocity of money…this is the essence of the conduit whole life insurance strategy because your cash value policy has served as a natural channel through which your money moves continually, growing perpetually to fund both your safe bucket and higher risk opportunities. Also, I should mention the fact that repaying your cash value NOT ONLY increases your cash value growth, but also increases the death benefit, leaving a powerful legacy to your loved ones. In the end, by employing Strategic Self Banking, you will have secured as much life insurance on your self as possible. For anyone interested in creating a legacy through life insurance, I can think of no better way than to continually grow your death benefit as you age. Upon death, not only will your family benefit from the countless cash flow assets you have created during your life, but your family will receive a death benefit that truly represents your human life value. And if you have taught your children about money by utilizing this amazing concept and they teach their children, the possibilities are infinite. Finally, any solid wealth building strategy needs to take into account WEALTH PRESERVATION. Just as important as any of the other steps, wealth preservation needs to take into aging, and the associated costs of living a long, fulfilling life. As you age, the chances of you needing some sort of long-term care service increases exponentially. It is highly likely that you or your spouse will need long-term care services one day. So, how does a proper wealth building strategy deal with long-term care? The good news is, that apart form your stand alone long term care insurance companies, there are newer hybrid long term care life insurance policies available that provide both lump sum death benefit protection, coupled with long-term care protection. If you are diagnosed with a chronic illness or severe cognitive impairment (Alzheimer’s, Dementia), the rider allows you to accelerate a portion of your death benefit to be used either as reimbursement or cash indemnity. The benefit to you is all your hard work to build your wealth and legacy will not be ruined by the need for long-term care later in life. Now will utilizing a “Strategic Self Banking” strategy be right for you? Because the truth is, while most folks could probably benefit by implementing this strategy in their lives, it’s not always the right “fit” for everyone. Particularly if you’re not 100% committed to the idea. Despite the fact that we here at I&E are big fans of the concept of “Self Banking,” we understand that it should only be one of several different strategies that we should present to a new client looking to protect the financial future of their loved ones. From there we can begin working together to help you find the “right” strategy for you. The good news is that because we are providing our clients with as many options as possible, we have committed ourselves to remain an independent insurance brokerage that is able to offer a variety of different insurance products from dozens of the top life insurance companies in the industry. We’re not stuck in a “one size fits all” approach to meeting your needs. Instead, we can let your needs guide us to what products might best suit you and then let you decide what’s best.